N 24° 24' 40" and E 88° 59' 12"
Natore in Natore District (Rājshāhi Division) with it's 369,138 citizens is a town in Bangladesh about 102 mi (or 164 km) north-west of Dhaka, the country's capital city. Current time in Natore is now 09:31 PM (Sunday). 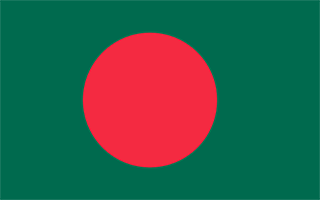 The local timezone is named Asia / Dhaka with an UTC offset of 6 hours. We know of 9 airports near Natore, of which one is a larger airport. The closest airport in Bangladesh is Ishurdi Airport in a distance of 18 mi (or 29 km), South. Besides the airports, there are other travel options available (check left side). There is one Unesco world heritage site nearby. It's Ruins of the Buddhist Vihara at Paharpur in a distance of 43 mi (or 69 km), North. Me and my friend in Paharpur! Its an old Buddhist Temple. Its relay a nice place for tourist. Demand for the trial of war criminals. Baral river is one of the offshoots of the Ganges, starts its journey at Charghat Upazila of Rajshahi District of Bangladesh. The Baral flows through Natore and Pabna meets with the Gumani at the east of Bhangura and finally meets with the Hurasagar river after joining with the Karatoya south of Shahjadpur Upazila. The river is approximately 147 kilometers long, and 410 feet wide and 20 feet deep on average. The river receives water from the Ganges only in the monsoon season. Located at 24.3333, 89.1 (Lat. / Lng. ), about 9 miles away. Adamdighi is an Upazila of Bogra District in the Division of Rajshahi, Bangladesh. Naming of this upazila or area as Adamdighi came from Adam's Dighi which means Adam's Tank. Adam was a great Muslim saint or dervish, known as Baba Adam. Located at 24.43, 89.1 (Lat. / Lng. ), about 7 miles away. Located at 24.3306, 88.9444 (Lat. / Lng. ), about 6 miles away. Located at 24.4139, 88.93 (Lat. / Lng. ), about 4 miles away. Located at 24.5, 88.9833 (Lat. / Lng. ), about 6 miles away. Located at 24.375, 88.85 (Lat. / Lng. ), about 9 miles away. Chalan Beel is a wetland in Bangladesh. It is a large inland depression, marshy in character, with rich flora and fauna. Forty-seven rivers and other waterways flow into the Chalan Beel. As silt builds up in the beel, its size is being reduced. Located at 24.52, 89.01 (Lat. / Lng. ), about 8 miles away. Located at 24.261, 88.972 (Lat. / Lng. ), about 10 miles away. These are some bigger and more relevant cities in the wider vivinity of Natore.